MP Luke Hall became a Defibrillator Champion to help prevent sudden caridac arrest in South Gloucestershire schools. SUDDEN cardiac arrest in young people could be reduced through campaigns with schools in South Gloucestershire. Schools are increasing access to lifesaving defibrillators in response to information which states that sudden cardiac arrest kills 12 people a week across the UK. 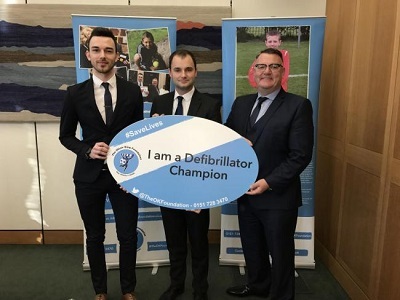 MP for Thornbury and Yate Luke Hall joined the Oliver King Foundation’s campaign as a Defibrillator Champion to help schools to raise awareness of sudden cardiac arrest in young people and promote lifesaving defibrillators in schools in the area. He said: “I am proud to become a local lifesaving Defibrillator Champion. It is vital that we take action to prevent any loss of life where one can be saved. Every year in the UK, 30,000 people suffer a sudden cardiac arrest and fewer than one in 10 survive. Early access to a defibrillator is vital as every minute that passes, chances of survival drop by 10%. A defibrillator costs schools £800 - £1000, and they come in the same size as a first aid box. The charity look forward to working with MP Luke Hall to help save lives in South Gloucestershire.